Wall of Leather details. I'm a big Mizuno and Rawlings fan, but love them all. Now, is that Franklin the same one thats been on ebay forever? Ha, most likely it is. Its surprisingly not that bad, soft leather, comfortable, but thin. I got it because I believe this was one of Franklins "better" gloves, and I did not have any Franklins and the condition was very good, looks unused. The one rule I did break, was that I usually will not get a glove I'm not familiar with unless the glove is marked with either "top grain" or "full grain" leather, that's a decent way to hedge your bets. If I get a dog, I just donate it. 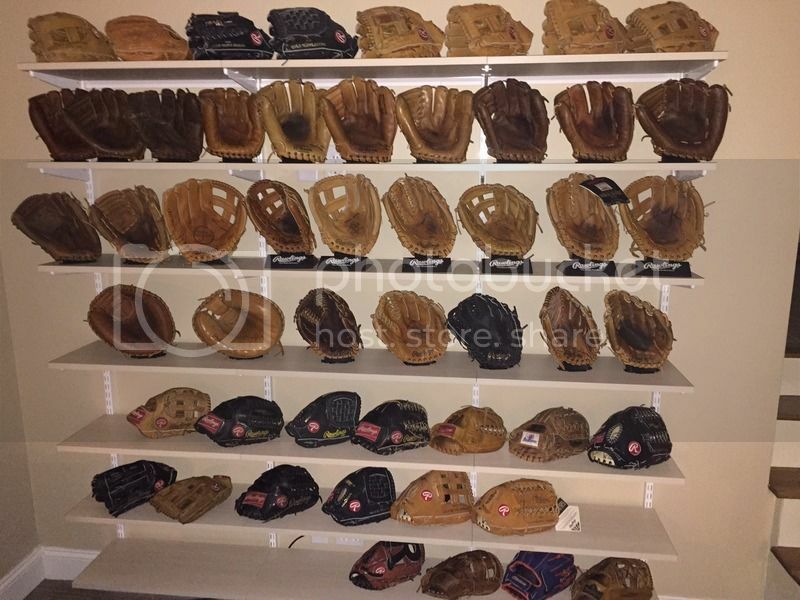 I typically coach older teams 12u and up and will bring 5 or 6 gloves with me to some of the practices for them to try, from newer models to the vintage stuff, the dads tend to like the vintage gloves from the 80s or 90s, the boys like the HOHs and A2000s. They usually have no idea of what a Nokona is and sometimes ask if it is a Japanese glove : ) I think Bob Storey would turn in his grave if he heard that. At the end of the day its cheap fun and they look and smell great.